Here are my May favourites including a few of the Kiko products I bought in Sicily. These are the ones that I like, the rest I really don't like so I'm going to review them separately. I'm sure it's just a matter of taste but would be interested to know what you think if you've tried any of their products. Keeeeko? Kiiiiko? I don't know. But however you say it Kiko is a cosmetics brand that seems to be increasingly popular among consumers, make-up artists and bloggers and not only is it reasonably easy to get hold if it's affordable too. I have to admit that when I have gone into their Westfield store I have felt pretty uninspired but then it's hard to be inspired by much in Westfield when most of the time it's heaving with people and shops feel the need to play really loud music (I'm such a mum). But on a recent trip to Sicily it was the only make-up shop I could find in Taormina so in I went and came out with a whole bagful of stuff (obviously). Like many make-up brands they seem to have their staples that they sell all year round and more seasonal products. I, rather foolishly, went all seasonal because I was a time limit before my husband had a melt-down and I do like what I've got but it's not blowing my tiny mind! It was a bit like something from Supermarket Sweep (yes you do remember it). 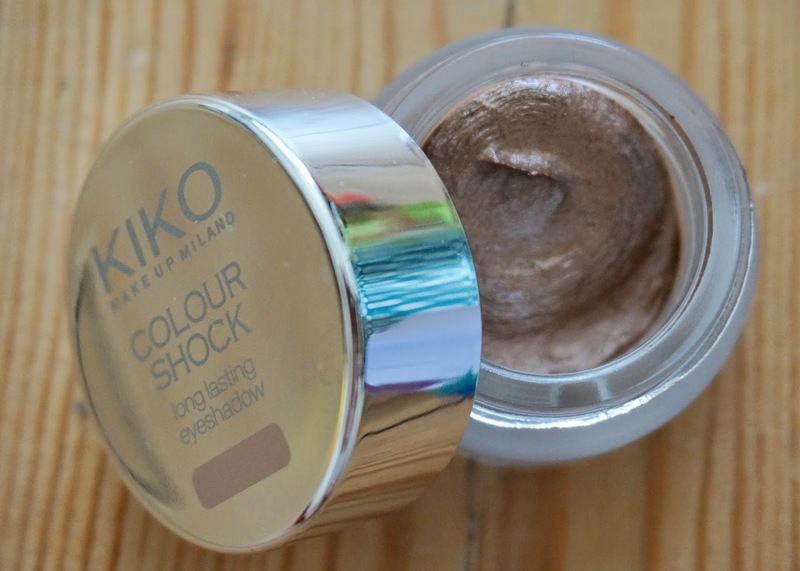 One thing I do really like is the Colour Shock Long Lasting Cream Eyeshadow which comes in 10 colurs and I got in 104 Snappy Brass because it was so beautiful and I thought it would get the most use. It's £5.50 on their website at the moment which is an incredible price for any good quality eye product and this is good. It's really easy to apply, has a lovely texture and finish and one pot will probably last a long time. I've had it a couple of weeks now and it's still as smooth and moussey as when I first got it - it hasn't dried out at all. My only fault with it, and it's minor, is that it is incredibly sparkley, much more than it looks like in the pot and more than I would usually choose to wear. I'm getting used to it though and it's lovely to quickly apply to change your make-up from day to night. 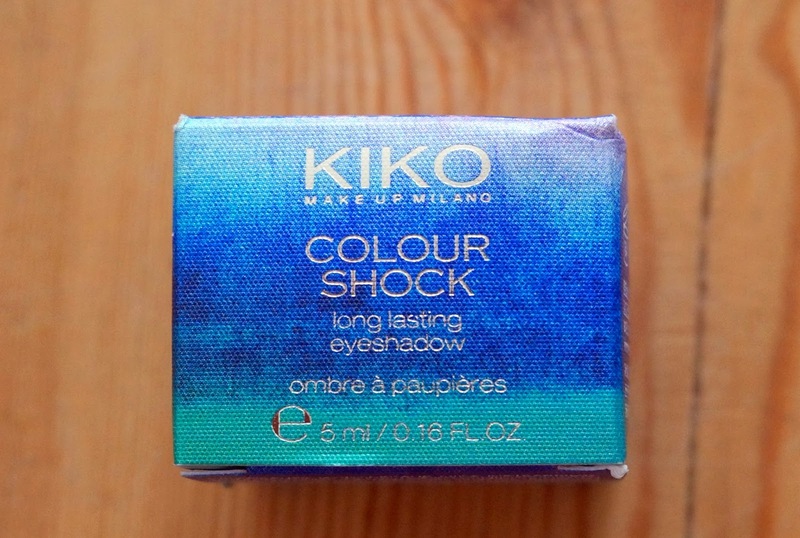 Kiko do some lovely bright colours in this so if you fancy getting on the blue/aqua liner trend that's big this summer but don't have a huge budget then this would be worth a try as it's incredibly versatile, liner or shadow I'm finding it hard to fault. I've been using these for the past couple of months and I'm a big fan. I often work with brides who don't want to wear lipstick and these are fantastic for adding a bit of colour to the lips and moisture to make sure you look completely put together. Available online here. Mum's are great because they always remember those little hang-ups you have even though most of the time they don't mention it. My mum and sister went to Paris for the night a couple of weeks ago and bought me back some really lovely hand cream (the L'Occitane handcream is one of my absolute favourites) and some L'Occitane Almond Lighter Legs gel cream because I've always had incredibly dry, eczema-prone skin on my legs, especially my calves which has been hard to get rid of over the years. I've been using the Almond Lighter Legs for just over two weeks and I love it. Not only is the almond smell absolutely divine - not too sickly as almond often can be - but my legs look so much better and still feel soft and moisturised well into the next day. The gel-cream contains peppermint which makes you legs feel fresh and soothed even when you've been pounding pavements all day and it absorbs into the legs really well, no greasiness at all. As for making my legs feel lighter I'm not sure about that as they didn't feel particularly heavy to begin with but I'm so impressed with its moisturising qualities I don't doubt it would do everything else it claims to. I particularly love this because I wouldn't have bought it for myself but I will definitely re-buy and get it for friends as gifts. I found this product difficult to review. Initially I didn't like it for it's lack of any coverage or evening of skin tone. Then I started to really like it's lightweight feel and slightly luminous finish. So although this will never really have quite enough coverage for me and I won't be buying it again I would recommend for someone who didn't need to even they skin-tone and just wanted a really light all-over base. Short but sweet, once again, only four products that really floated my boat this week. All links are below. I'd love, love, love it if you subscribed to my channel and checked out my other videos.